We’ve spotted some easy and affordable St. Patrick’s Day decorating ideas from our favorite crafty bloggers that won’t break the bank. You won’t need the luck of the Irish to recreate the stylish St. Patrick’s Day decor featured here! Amanda Causey from Green Owl Crafts created this adorable arrangement of DIY St. Patrick’s Day decor with simple objects easily found around the house. To get this look you will need mason jars (or other clear glass containers), split peas, decorative paper for the shamrock flowers, adhesive spray, twine or ribbon, skewers and a frame. 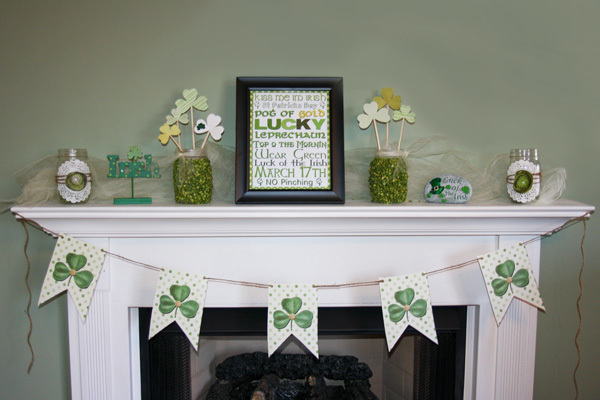 The framed artwork and shamrock banner were created from printables, while the shamrock flowers were created with a template traced onto decorative paper. Get the free printables and templates from Green Owl Crafts. 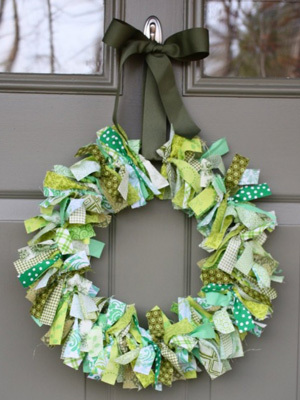 Welcome guests with this easy fabric St. Patrick’s Day wreath shown on The Magic of Ordinary Things. Crafter Kristol Charles created this fun cloth wreath using extra fabric scraps in green colors and a wire wreath frame. A combination of playful prints in vibrant green hues ranging from chartreuse to forest green keeps this wreath looking fresh and will last past the Irish holiday to welcome spring. Afraid your hard work will take a beating outdoors? Turn the wreath horizontal, add a hurricane vase with a candle and use it as a centerpiece. Kim Stoegbauer, editor and designer of The TomKat Studio, created these St. Patrick’s Day prints that were featured by HGTV. Simply print out the 4″ x 6″ and 5″ x 7″ designs and frame. The modern graphics also look great as the front of a greeting card or party invitation. 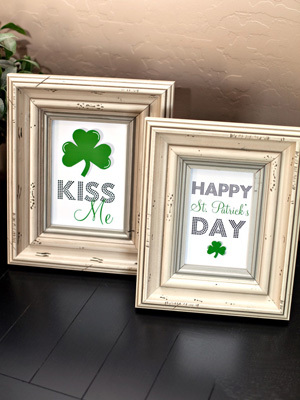 Go to TomKat Studio for the free prints and get more ideas for homemade St. Patrick’s Day decorating. 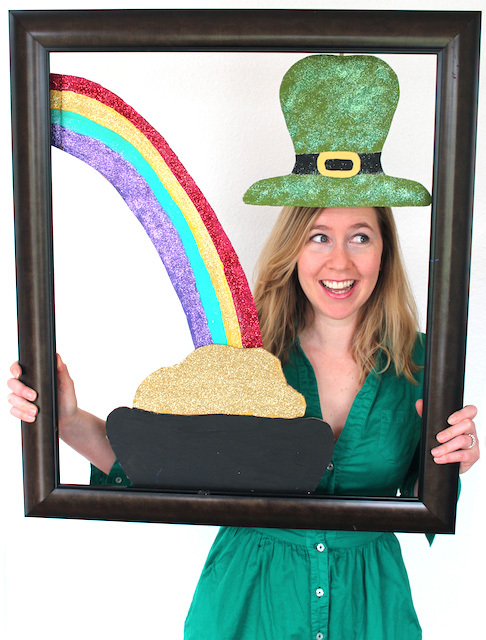 This St. Patrick’s Day photo frame created by married crafting duo Andrea and Cliff Currie is sure to be a hit at your St. Paddy’s bash — with little and big kids alike. Keep a camera handy to capture the memories (and, ahem, to document what happens after one too many green beers). Materials used in the Hand Make My Day custom craft include: frame, cardboard, paint, glitter, scissors, hot glue gun and foam brushes. Whether you are celebrating St. Patrick’s Day with a family-friendly Irish dinner or all-out green-themed bash, these decorating ideas will help you celebrate in style. Photo credits from top: Green Owl Crafts, the Magic of Ordinary Things, the Tom Kat Studio courtesy of Vicki Lynn Photography, Hand Make My Day.